It is hard to imagine a more beautiful geographic location to wet a fly line than in the Pacific Northwest. There are relatively few places where the average fly fisherman can have a reasonable chance at hooking into a 10+ pound fish. The rivers are big, the fish are big, and the weather is generally mild. Yes, it can be wet at times, but this is a small price to pay in my opinion for such opportunities. 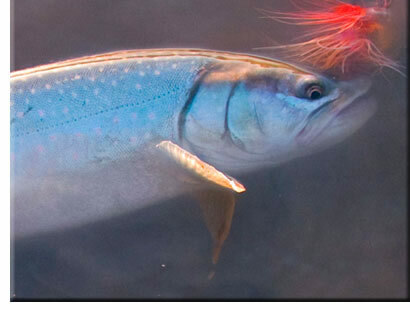 One of the most important factors in being successful in chasing anadromous (ocean going) fish is to remember that they are not always present in fresh water. Another thing to remember is that they are almost ALWAYS moving. You may find fish one day and then return to the same spot the next day to find nothing there. Likewise, just because you didn't see fish in a prime location one day doesn't mean that you shouldn't check back again the next. Although every river system is different, the following run timimg calendar will give you an idea of what fish are available during the calendar year. In Alaska, this calendar will also serve as a general reference, with one difference being that in Alsaska, Chinook Salmon generally enter the rivers in late June through July. 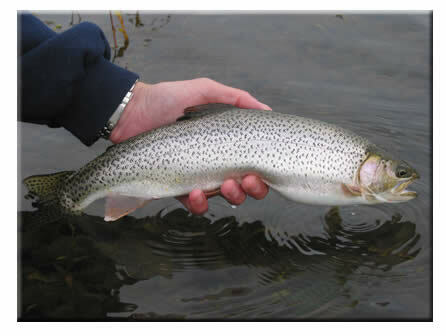 Rainbow trout are an interesting species which are native to the Pacific Northwest and Alaska. Depending upon the geographic location in which they're found, some rainbow trout are resident, meaning that they spend their whole lives within a given river system. However, some number of that population evolved to become very migratory, only spending a year or two in fresh water before migrating to the ocean where they can find ample food supply. Once there, they'll spend another year or two in the salt prior to migrating back to their natal fresh water streams to reproduce. These migratory rainbow trout are known as steelhead. 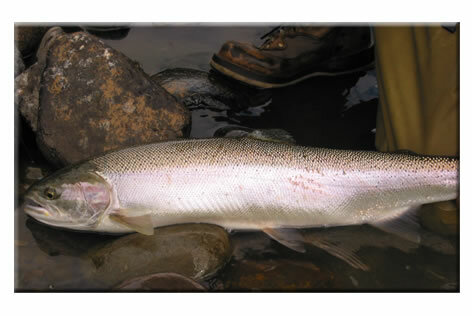 Rainbow trout and/or steelhead are both genetically the same and it is refleced in their latin name Oncorhynchus Mykiss. 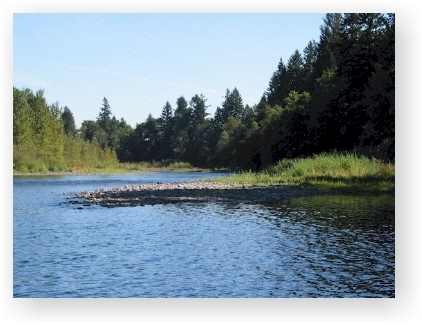 In Washington, Oregon, Brittish Columbia, you'll generally find trout in rivers east of the Cascade mountain range. There are numerous lakes west of the Cascades that also hold Rainbow. 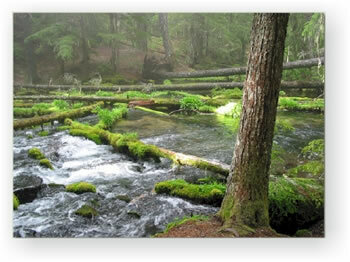 West of the Cascades, again, due to geological factors and the amounts of rain we receive, we do not have rainbow trout. The rainbow trout here are steelhead. In Alaska, because of the large number of salmon and different geological conditions, there may be trout and/or steelhead. Steelhead are found generally found in the more southern regions of Alaska. Trout are found in the more northerly areas because they feed upon salmon flesh, salmon eggs, and emerging salmon fry. When they're able, trout like to overwinter in lakes. Rainbow/Steelhead both spawn in the spring. Depending upon how far the natal river is from the ocean will determine whether a river receives summer steelhead, winter steelhead, or both. To make things more complex, because many rivers have hatchery production in place, many rivers that once only received fish at one point of the year may also receive fish nearly year-round. Coastal or Sea-run cutthroat trout are the only cutthroat that live in both salt and fresh water. Somewhat like steelhead, they have the ability to migrate to and from the salt into fresh water where they'll spawn mulitple times in their lifetimes. In some regions, they may be more plentiful in freshwater during the spring, in other locals, they may be more present in fresh water during the fall months. Many fly fisherman fish for them nearly year-round in Puget Sound. They are exceedingly aggresive, and will chase both top water and subsurface flies. Additionally, here is another article about fly fishing in Alaska Fly Fishing Katmai National Park, Alaska that includes a ton of information about fly fishing for pacific salmon. Between Alaska and Northern California, there are a couple of different species of char which inhabit our waters. We tend to find Bull trout in Washington and Oregon, and Arctic Char further on into Alaskan waters. They are also a very aggresive fish - and exceedingly pretty. As with most outdoor sports, it is imperative to dress appropriately prior to heading out for a day of fishing so that you're as comfortable as possible. Being properly outfitted for the elements can make or break your trip. A GoreTex rain coat, a polar fleece jacket, GoreTex or neoprene waders and sturdy boots are a must. You may want to bring a pair of gloves for those early mornings and/or wet conditions. Plan on having some rain during your outing, sometimes you should just plan on it raining during your entire trip. Rain and/or overcast skies often improves the fishing dramatically so most Northwest Fly fishermen actually look forward to inclement weather. Most of the fishing for Pacific Salmonids in the Northwest is done using 4 to 8 weight rods, depending upon the targeted species. A good reel, a good line, and plenty of backing are a must. Fly lines that incorporate multiple heads from floating to various sink tips often give the fly angler the edge needed to be successful. As for leaders, a standard salmon/steelhead leader of 9 1/2 feet will work for floating line presentations. If sink tips are used, a simple 4-5 foot length of strong leader is all that is required. Tippets may vary between 5-15 lbs. depending upon which species is being targeted. In addition to the above mentioned gear, one cannot under estimate the value of having a good pair of polarized glasses. Polarized lenses allow the angler to peer into water that would otherwise prevent the naked eye from distinguishing fish. Knowing where the fish are located and being able to observe your fly and how the fish react with it can make or break your day. As one can guess, with the amount of precipitation that the pacific northwest and Alaska recieve, many of our rivers are broad, wild, and beautiful places. Because of this, many fisherman would be wise to consider improving their casting if they're hoping to be successful. Because of the amount of rain we receive, especially in the winter/sping months, rivers that were safe one day can literally change over night to become raging torents that take fisherman's lives. Regardless of when you're here, pay careful attention to the weather and precipitation forecasts so that you're safe. When you're out fishing, it's wise to have a backup set of clothing handy should you get wet, hypothermia can set in quickly.